As most Siddha Yogis may know, in 2004 the SYDA Foundation Trustees established a policy that would ensure the Siddha Yoga path was more accessible to the global sangham and new seekers. This meant that instead of continuing to run Shree Muktananda Ashram as a large-scale event venue where thousands of seekers and visitors were hosted on a daily basis, the resources of the SYDA Foundation would be focused on developing teaching and learning events to be made available wherever people live. In this world, any time a decision of this magnitude is made, there is a transition period. For this policy decision there was a transition period for both Shree Muktananda Ashram and for Siddha Yogis throughout the globe. People who were accustomed to visiting Shree Muktananda Ashram regularly to participate in all the Siddha Yoga practices, including offering seva, had to reconceive of how they would continue to maintain their connection to their Siddha Yoga sadhana. Many people had come to rely upon their visits to Shree Muktananda Ashram as the way to revitalize their sadhana. Therefore when the policy was put in place, it was met with many different reactions. Although the policy did not mean closing the doors to Shree Muktananda Ashram , this seemed to be a misunderstanding among some people. They thought that this was what the policy entailed. In fact, that was not the case. We want to take this moment to clarify that the Ashram was never closed and has never been closed. Rather, with the policy, SYDA Foundation leadership put in place a system whereby people could express their interest in, and qualifications for, offering seva in Shree Muktananda Ashram. In this way they could contribute to the fulfillment of the core purpose of the SYDA Foundation: to protect, preserve, and facilitate the dissemination of the Siddha Yoga teachings. To help Siddha Yogis understand this new direction, the Siddha Yoga Mission Briefing was created and made available to thousands of people, through in-person meetings, phone calls, and audio presentations, and later through the Siddha Yoga path website. A lot of work was put in by the SYDA Foundation staff members and by sevites from around the world who came forward to contribute hands-on support. They helped give clear education to the global Siddha Yoga sangham regarding the purpose of the SYDA Foundation and the work taking place in Shree Muktananda Ashram. In a short span of time, a high percentage of Siddha Yogis got on board and offered seva in support of the Siddha Yoga path becoming more accessible worldwide. It was because of the commitment, dedication, and studentship of so many that the SYDA Foundation was able to achieve the goal of the policy. During the transition after the policy was instituted, there was a “right-sizing” of the personnel in Shree Muktananda Ashram, and the physical spaces in the Ashram were reconfigured to suit this new focus. The offices were centralized in one Ashram building, Atma Nidhi, whose name means “The Treasure of the Self.” And the SYDA Foundation leadership made a concerted effort to support the staff in learning how to incorporate the Siddha Yoga practices into their schedules as they offered seva long-term. For example, the leadership established a system by which each staff member committed to participating in a certain number of namasankirtana and svadhyaya sessions in the Ashram Daily Schedule each week. It was at this time that Management for Shree Muktananda Ashram decided that a small murti of Bhagavan Nityananda would be installed in Atma Nidhi. This would allow the sevites who offer seva in that building to have Bade Baba’s darshan daily and thereby reconnect with their purpose for serving in the Ashram. Bade Baba’s teaching is The Heart is the hub of all sacred places. Go there and roam. Isn’t it true? When you have Bade Baba’s darshan, you cannot not go there, to the shrine of God! For this reason, Gurumayi requested that the sevites in the SYDA Foundation revitalize the Siddha Yoga path website, which had been in existence since 1997. We don’t need to tell you just how exceptionally the Siddha Yoga path website has fulfilled the original intention of the policy established in 2004. However, we can’t resist mentioning one milestone event: the very first live video stream, in 2013—a maha-abhishek of Bhagavan Nityananda ! With the re-launching of the Siddha Yoga path website, Gurumayi gave the name “Siddha Yoga Universal Hall” to the space in which Siddha Yogis and new seekers living in all parts of the world come together, as one sangham, to participate in teaching and learning events. Many of these events have been broadcast from Shri Nilaya , and therefore Shri Nilaya has become the Universal Hall. In September 2018, seven years after the website was revitalized, Gurumayi requested that the leadership of the SYDA Foundation bring Bade Baba’s presence into the Universal Hall, instead of continuing to house his murti in a smaller space next to the hall. When Gurumayi spoke about this upcoming relocation during a recent satsang in Shri Nilaya, many people expressed their delight and anticipation. Nonetheless, it was also a moment of readjustment. Not everyone was certain of what this change would be like, or how it would all come together. As you know, any change requires a little time to get behind. A little time is needed for the impact of the Guru’s words to dawn upon you. And then you continue to experience deeper meanings of that guidance as time goes by. On Thursday, September 20, 2018, the eighth day of Ganesh Utsava, the murti of Bhagavan Nityananda was brought to the new puja altar in Shri Nilaya. This exquisite altar, placed in the center of a gracefully curving arch, directly faces Gurumayi’s chair. As soon as Bade Baba arrived in Shri Nilaya and took his seat on the puja altar, a gentle “peacock” rain began to fall. We felt that Mother Nature was rejoicing in this auspicious moment. We experienced Bade Baba’s golden countenance and gracious glance permeating the entire space. It’s so amazing—we had thought the atmosphere in Shri Nilaya was already electric, from Gurumayi’s presence, from the Siddhas’ presence, and from all the Siddha Yoga practices that have been performed there. Little did we realize that every molecule in the atmosphere could be even more charged with the sweetest shakti! It gave us food for thought: how can honey be sweeter than honey? We would like to now take you on a journey even further back in time. It was forty-seven years ago, in 1971, that the first murti of Bhagavan Nityananda was installed in a Siddha Yoga Ashram . From the 1950s onward, first hundreds, and then thousands of people, from all parts of the world, would visit Gurudev Siddha Peeth. Baba Muktananda would sit in the courtyard and give darshan and teachings for hours and hours and hours as the devotees would ask questions, pray for all kinds of things, and share about their sadhana. We wouldn’t be exaggerating if we said that the days and years went by in one endless satsang with Baba Muktananda. It must have been in one of these conversations with Baba in the late 1960s that some of these visitors, recognizing Baba’s love for his Guru, brought up the idea of installing a murti of Bade Baba in his Samadhi Shrine in the nearby village of Ganeshpuri. Baba must have agreed with this idea, because he then personally oversaw creation of the murti. Every few days Baba would travel to Mumbai, where the sculptor lived, and check on the progress of the emerging murti. Along the way the sculptor asked Baba if he had captured Bade Baba’s expressions veritably, and at times Baba would make refinements himself. Once the sculptor had completed his work, the statue was brought to Gurudev Siddha Peeth, where Baba gave it the finishing touches before the installation. To make a long story short, that is exactly what happened! The ceremony to install Bade Baba in the Temple in Gurudev Siddha Peeth was held on May 10, 1971. On this historic occasion, Baba said, “I proclaim with all my power and with all my authority that if you have darshan of this murti with deep devotion, if you plunge into the heart of its mystery and respond to the love glowing in Bade Baba’s eyes, the radiance brightening his form, you will actually see Nityananda in his full glory.” Nityananda—the bliss of eternity. Many of those present at that time shared that after this ceremony, the effects on the atmosphere in the Ashram were palpable. The air seemed to pulsate even more with shakti; the pull to delve within was even stronger. Most devotees felt that with Bhagavan Nityananda’s presence in the Ashram, his larger-than-life-size murti, they now had two Babas! More shakti. Coming back to the present moment: here in Shree Muktananda Ashram, the satsang on September 20, 2018 to welcome Bade Baba to Shri Nilaya was reminiscent of that first inauguration. All of us, staff members and visiting sevites, stood before Bade Baba in complete stillness, absorbing the golden rays of grace emanating from his being throughout the space. A few moments later, we were awakened from our absorption to take delight in the sound of Gurumayi’s laughter rippling out from Nidhi Chauk! It was 10:45 a.m. when Gurumayi entered Shri Nilaya; she walked to Bade Baba’s new puja altar and offered pranam. We brought our hands together in reverence for a few moments. Then we watched as Gurumayi cast her gaze over each of the articles of worship that had been placed on tables to the side of the puja altar. These were the offerings Gurumayi would be making to Bade Baba. They had been lovingly prepared by sevites under the supervision of Swami Asangananda, who has been the caretaker for the two murti of Bade Baba in Shree Muktananda Ashram since 2006. How exquisite the array of offerings was—vibrant kumkum, turmeric, and sandalwood paste; delicate grains of rice; aromatic oils; softly scented roses and garlands of fragrant mogra; bowls and bowls of delicious fruits; and a sweet coconut. Gurumayi began making these offerings, and we chanted Om Namo Bhagavate Nityanandaya in the Jhinjhoti raga, which evokes love and tenderness. Among all the chants in the Siddha Yoga canon, this is the chant that most encompasses the experience of receiving the Guru’s grace and blessings—especially for all of the Siddha Yogis who have been following the Siddha Yoga path since the 1960s and '70s and '80s. After Gurumayi offered puja to Bade Baba, she also made offerings to Baba Muktananda’s image and the images of all the Siddhas, honoring the Siddha Yoga lineage and heritage. We sang the opening verses of the Morning and Evening Arati, followed by the Nityananda Arati, in praise of the one who had taken his new seat in the Universal Hall. We concluded the puja to Bhagavan Nityananda with three resounding rounds of Sadgurunath Maharaj ki Jay! Then we were all requested by the host, Denise Thomas, to rearrange the hall for satsang with Gurumayi. It felt like one seamless flow of worship; we were moving chairs, setting up instruments, placing mics in the lingering incandescence of the puja, all the while looking at one another in awe and wonderment. During this rearrangement of the hall, Gurumayi walked to one of the windows, where a likeness of Bade Baba is etched in the glass. You may have seen this window on the Siddha Yoga path website, as well as another such window with a beautiful etching of Baba Muktananda. These windows are on each side of Gurumayi’s chair. Gurumayi noticed that a golden canna lily was blooming outside, just below Bade Baba’s window. She said, “It looks like that flower is growing just for Bade Baba. ” Gurumayi then took her seat in the front of the hall facing Bade Baba’s puja altar. Now, for the first time ever, satsang with Gurumayi was taking place in Shri Nilaya in the presence of Bhagavan Nityananda’s murti. We all immediately looked around the hall, taking in the experience. Later some of the participants shared with us what this moment was like for them. Now we want to give you a panoramic view of the Universal Hall. Come with us as we embark on a yatra to each of the sacred sites in this space. Shri Nilaya is an expansive oval meditation hall. During the day it is bathed in light streaming in from the wide skylight and large windows that provide a view of the gardens beyond. At the south side of the hall is Gurumayi’s chair, from where Gurumayi has held satsang innumerable times—imparting teachings, chanting, leading us in meditation, and giving darshan. We worship Gurumayi’s chair in this hall every day as the seat of Guru’s shakti. On either side of Gurumayi’s chair are the two large windows etched with images of Baba Muktananda and Bade Baba. And above Gurumayi’s chair hangs an exquisite sepia portrait of Baba Muktananda. Moving in a clockwise direction from Gurumayi’s chair, along the west wall, we see images of seven Siddhas whom Baba Muktananda revered—Rangavadhut, Sai Baba of Shirdi, Akkalkot Swami, Ranchhod Bapu, Hari Giri Baba, Zipruanna, and Siddharudha Swami. On the north wall there are three puja altars scintillating with shakti. First comes the puja altar dedicated to Baba Muktananda. Next, in the center, is Bade Baba’s new abode. And on the right side of the wall is the altar to Mahalakshmi. As we continue around the hall, we see the entrance to Shri Nilaya, on either side of which there are images of Baba and Bade Baba. Then on the east wall there is a series of beautiful brass panels on which the full text of Shri Guru Gita is engraved. 360 degrees of grace, indeed! Let’s return now to the satsang. 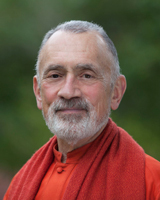 To honor this great day, Swami Ishwarananda gave an extended sharing that he had prepared in advance. We listened with rapt attention as Swami ji relayed, as part of his sharing, two stories of Bade Baba’s miracles. It reminded us of one of our favorite Siddha Yoga courses—the Miracle Course! This course was first held in July 1997, and was held again during many summers in honor of Bade Baba’s Punyatithi and in celebration of the benediction that his grace offers this world. Many wondrous stories were told in this course about Bade Baba’s life and teachings, and about the miracles that took place in his presence. These stories were gathered by teams of sevites who had traveled throughout India at Gurumayi’s request, interviewing people who had known Bade Baba during his lifetime and experienced these miracles firsthand, or else had heard these stories from their parents, from other elders in their families, and even from neighbors. As Swami Ishwarananda spoke, we were reminded of how these stories of Bade Baba never get old. And we never get tired of hearing them! Each time a miracle story is told, it is imbued with new rasa. And when it’s told by a different person, it feels like we’ve never heard it before! The point we are making is that though these stories of Bade Baba’s miracles are from a century ago, they are forever fresh. Jay Bade Baba! After Swami Ishwarananda’s sharing, Swami Akhandananda read Gurumayi’s poem A Temple without Form , which she wrote in 2011 in honor of Bade Baba’s Golden Punyatithi. This sublime poem was like a dharana, leading us into deep meditation. Somewhere on the periphery of our awareness, we heard the gentle sounds of chimes and gong. Time and space took shape again. We slowly opened our eyes and heard, from the harmonium, the introductory notes of Shri Avadhuta Stotram—a hymn that extols Bhagavan Nityananda and describes his state of perfect freedom. What a wonderful tradition we have on the Siddha Yoga path—we chant, and chant some more; we do puja and do puja some more; we perform arati and perform arati some more! This satsang was just the same. We were only too happy to come to our feet and sing Jyota se Jyota Jagao to Gurumayi. Just when we thought the satsang was concluding, Gurumayi spoke for a few moments to the Siddha Yoga musicians, who had lagged a bit in their instrumental introduction to Jyota se Jyota Jagao. Gurumayi said, “Don’t just go through the motions of living life. Ensure each moment receives your full attention. Each moment is alive. During celebrations like this, there are waves of shakti surging, and therefore you need to learn to ride the crest of each wave.” As Gurumayi was speaking, she made the gesture of massive ocean waves rising and subsiding. It was so beautiful. We were riveted by Gurumayi’s words and mesmerizing gestures. Suddenly Gurumayi began to sing Anandatse Dohi Ananda Taranga a cappella. for bliss is the nature of every particle of this body of bliss. We all joined in, and very quickly Shambhavi Christian, one of the senior Siddha Yoga musicians, rode the crest of the wave and leapt into action. She took over on the harmonium and began to play the melody. As we were all singing the refrain with Gurumayi, she rose from her chair and walked down the aisle, encouraging people to continue singing. Gurumayi approached Bade Baba’s puja altar. After offering pranam, Gurumayi looked back at the ensemble and realized that this entire time, people had only been repeating the refrain! So then Gurumayi walked back and started singing the first verse. Shambhavi and Walker Jones, the music conductor, got with the program right away. Gurumayi seemed so pleased as we rode the waves of the verses that followed. We continued to sing this melodious abhanga, and Gurumayi walked to the puja altar for Mahalakshmi at the entrance to Shri Nilaya. Gurumayi offered cascades of rose petals to the goddess of supreme love, beauty, and prosperity. Now, we would like to take you on another journey back in time. This painting of Mahalakshmi was created at Gurumayi’s request between November 1986 and February 1987 in Gurudev Siddha Peeth. At the time, many Siddha Yogis were feeling unsure of how to reconcile following a spiritual path with earning money and attending to worldly duties. Gurumayi teaches that pursuing sadhana is not at odds with living a prosperous life. Mahalakshmi gives wealth in all areas of life; she bestows both material abundance and spiritual wisdom. Therefore, Gurumayi requested that this painting be created, and that a course on Mahalakshmi be given. This course was first held in the summer of 1987, after the painting was complete. Participants learned about the many forms and aspects of the goddess, and they invoked her shakti within themselves by reciting mantras, singing hymns, and chanting of her glory. Every day, and especially at those times when the artist—a well-versed portrait painter from Australia—set out to create a new feature of the painting, she would come to the courtyard where Gurumayi gave darshan daily. She would humbly invite Gurumayi to visit her while she created her rendering, so as to ensure she was fully implementing Gurumayi’s vision of Mahalakshmi. For this reason Gurumayi was involved in every detail of this painting. Gurumayi gave instructions to the artist and even worked on parts of the painting herself. The artist recorded in her own account in Shakti Punja that each evening as Gurumayi would go on her walk in Gurudev Siddha Peeth, the artist would watch Gurumayi through the window and find endless inspiration. The rose the goddess is holding in her left hand is inspired by Gurumayi holding that same rose. And the shape of Mahalakshmi’s resplendent crown is based on a peach-colored hat that Gurumayi wore at the time. This exquisite representation of the Devi, and the puja altar before her, has graced Shri Nilaya ever since this sacred space became, first, the main satsang hall in Shree Muktananda Ashram, and then the Siddha Yoga Universal Hall. Remember how Gurumayi said that in Shri Nilaya, the Universal Hall, we are now surrounded 360 degrees by the presence of the Siddhas? With the relocation of Bhagavan Nityananda’s murti, with the presence of Bade Baba in Shri Nilaya, we are truly encircled by grace. Our sadhana is enriched by the Guru’s teachings. Our life is enfolded in their grace and blessings. The Universal Hall has become a mandala, a circle of divine energy, with the Guru’s shakti at its center. We hope that, through this narrative, you have learned something new from our trips down memory lane and have been able to taste the rasa of this momentous day. May Bhagavan Nityananda’s sweetest shakti flow through your waking, dream, and deep sleep states, so that you bathe in the bliss of eternity. May Baba Muktananda’s sankalpa that seekers everywhere receive the awakening of Kundalini Shakti through the Guru’s diksha come to full fruition, so that the world is abundant with those who know the bliss of freedom. May Gurumayi Chidvilasananda’s grace and teachings give seekers all over the world the experience of the bliss of the play of Consciousness. 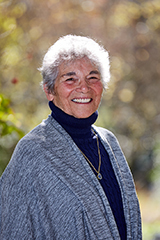 Kshama Ferrar has been practicing the Siddha Yoga teachings since 1974, and for the past forty years she has offered seva on the staff of the SYDA Foundation. She served as editor or co-editor of more than twenty books published by the SYDA Foundation, and also served as a writer and editor for Darshan magazine. While serving in the SYDA Foundation, Kshama has been a teacher and mentor to generations of Siddha Yoga sevites, inspiring them with her clarity, her love for the Guru, and her profound knowledge of the Siddha Yoga teachings. Kshama holds a master of arts in literature from New York University and a master of philosophy in sociology from Columbia University. Currently, Kshama offers seva as a writer and editor in the SYDA Foundation Content Department and as an instructor of Shiva-Shakti Movement.